Arthur C. Clarke’s 2001: A Space Odyssey is a novel that I will never forget. It has the distinction, for me, of being the first ever full-on space opera/science fiction novel that I ever read (I am not counting the young adult Animorphs novels). It was also the first novel I read at my new school in Dubai when we moved there in July 2001 (I read the book sometime late September 2001). To this day, I remember the book very fondly. It started off in an amazing place, and it ended with the most wondrous climax that I’d read to date, and that applies to all the hundreds of novels I’ve read since then. There is something about nostalgia, and that first book. Frank Herbert’s Dune will always be an amazing masterpiece for me and a true space opera classic, but 2001: A Space Odyssey is a great companion at the top of that table. 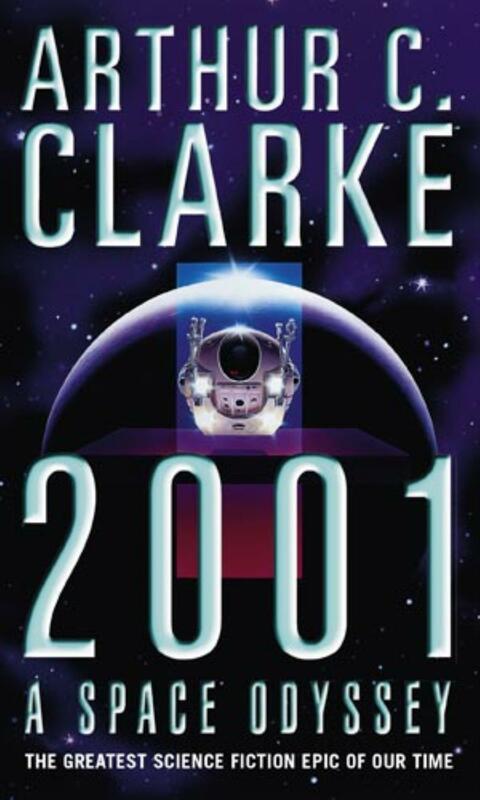 Clarke’s novel is the one that really set me on the path to reading the wider science fiction and fantasy genres, and that is why it will always have a special place in my heart. Just a few days ago, I re-read the novel for the first time ever since that first reading almost twelve and a half years ago. The sense of wonder and grandeur in the novel is just as compelling today as it was to an inexperienced reader all those years ago. A timeless classic. Note: This novel is part of my 25 Series To Read In 2014 challenge. For an impressionable young kid, this novel had it all. A grand epic story that stretched for thousands of years. A tale about human evolution. A tale about human and computer foibles and failings. A space station. A manned mission to the moons of Saturn while passing the Red Planet and Jupiter along the way. Tense drama between humans and a computer. The promise of alien enlightenment as to the true workings of the universe. That’s what I remember reading about all those years ago and the re-read refreshed all these points for me. Personally, I think that a novel like 2001: A Space Odyssey can never be written again. It has a certain romantic and magical quality to it, in the promise that by the year 2001 we would have a viable space program and that we would have moved beyond our petty differences to embrace a future of cooperation. Reality has failed to match up to that vision of course, and I find myself quite despondent about it. In fact, I have had such feelings ever since the last Space Shuttle was retired. It was the end of an era. And I wonder when humans might go back out there again. To the moon. The first human treads on the surface of Mars. Reading this novel made me cry for what we have failed to realise, what has failed to come to pass. We have failed as adventurers and explorers. This is why I love Star Trek as a setting so much, particularly anything to do with the Enterprise and its legacy (barring the new films of course). Then, the focus was always on exploration. That was indeed the mission of the ship. This novel reminds me of all that could have been. Anyways, getting back to the novel. The manned mission to Saturn’s moons is the primary story in the novel. It is the prime focus, with everything that comes before being the setup for such. In David Bowman, HAL9000 and the other characters, Arthur C. Clarke created an amazing cast of characters who take you along for an exciting and thrilling ride. There is so much tension in these scenes, even when Bowman and his fellow astronauts are carrying out routine work on their ride. And along the way, we get some really awesome and detailed descriptions about Jupiter, Saturn and the latter’s ring system. These are the details that really pulled me in. I was totally lost in the description of a probe descending through Jupiter’s atmosphere, until it eventually got crushed under the immense pressures. I was fascinated by the descriptions of Saturn’s moons and ring system. Such incredible work, with such an eye for detail and such a grand vision. Think about it. A space craft launched from Earth, carrying a crew of astronauts trained for the exploration of another planet’s moons. And above and beyond everything is the central narrative of this novel: that some mysterious aliens left a device on Earth that aided in the development of humans down the ages and that was eventually buried on the Moon to mark the level of technological superiority of the human race that would classify it as ready to do something great. Such as joining the galactic community for instance, we don’t know. This is the thread that runs throughout the novel and it is the once object in the entirety of it that provides some of the greatest wonder for the characters, no matter which era of Earth’s history or present or future we see here. In the end, we come down to one of the most mind-numbingly awesome visuals ever. When Bowman makes that big leap and he is exposed to wonders that no man has ever imagined. The sights. The sounds. The mood. The atmosphere. The feelings. The experience. Arthur C. Clarke’s incredible vision is made manifest in this novel, and I was along for a ride that thrilled me with every moment. If I can ever write something with a hundredth of the same impact, I would consider myself incredibly lucky. I so dearly wish that I could explain just how amazing those visuals were. The writing really pulled me in. I could just imagine seeing those same visions for myself, being in place of Bowman. And that is an incredible kick for me. Having now read the book after all these years, I now have a hankering to watch the movie. The novel and the movie were developed in parallel to each other, and while there is a lot of new material in the former when compared to the latter, the movie too is quite an incredible piece of tech wizardry. I saw it for the first time in my first semester at college, and I remember that I was wowed. Not as much as the book, but wowed all the same. And of course, can we really ignore the predictive powers that Clarke exhibited here? I mean, we do have a space station in orbit around the Earth, one which is staffed by astronauts from all over the world. And as my blogger friend Ole pointed out in his own review, he pretty much predicted reading news on a handheld electronic device. Umm, smartphones and tablets? Fun little point in the novel that transcends the material for a modern audience. If you’ve never read the book, then I highly suggest that you do. If there ever is a book that could be considered a foundational novel for the space opera genre, then 2001: A Space Odyssey is that novel. Posted on February 21, 2014, in Book Reviews, Review Central and tagged 2001: A Space Odyssey, 25 Series To Read In 2014, 25-in-14, Adventure, Aliens, Arthur C. Clarke, Astronauts, David Bowman, Epic Science Fiction, HAL9000, Hutchinson, New America Library, Roc Books, Science Fiction, Science Fiction Classics, Sentient Computers, Solar System, Space, Space Opera. Bookmark the permalink. 2 Comments.